The distinction of having been the first British aviator to make a controlled flight is held by Lieut.-Colonel J. T. G. Moore-Brabazon. It is true that A. V. Roe (now Sir Alliott Verdon-Roe) made a controlled flight of 75-150 feet in 1909. This distance, however, was not considered to be sufficiently long for a controlled flight, and the record was disallowed by the Royal Aero Club, which awarded the honour to Moore-Brabazon for a flight the same year. 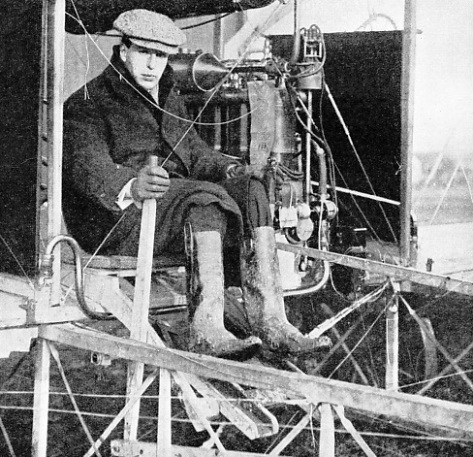 Henry Farman also flew an aeroplane before Moore-Brabazon, in 1907; but, although Farman was English born, he was domiciled in France and was not, therefore, able to qualify. THE FIRST FLIGHT of a circular mile in Great Britain was made in the aeroplane shown in this photograph. The machine was built by Short Bros, and was similar to one used by the Wright brothers. Lieut.-Colonel Moore-Brabazon flew it to win a prize of £1,000 offered for the first aeroplane designed and built in Great Britain to fly a circular mile. Moore-Brabazon was educated at Harrow, and after he had served an apprenticeship at the Darracq engineering works in France he became interested in aviation in Great Britain. An aeroplane was built for him at Brooklands by Short Brothers, who were then balloon manufacturers, but who later developed into the famous firm of Short Bros, Ltd, of Rochester, Kent. Moore-Brabazon’s attempts to fly this machine were unsuccessful. He then decided that it was essential for him to return to France, where aviation was making rapid progress. It was after he had mastered the intricacies of the Voisin biplane in France that Moore-Brabazon was acknowledged as the first British pilot to have made a controlled flight, and he received No. 1 Royal Aero Club pilot’s certificate. He brought the Voisin biplane to England and made several flights in it. He was then attracted by the prize of £1,000, which was offered by the Daily Mail for the first British-built aeroplane to fly a circular route of one mile. Short Bros, were then building an aeroplane, which was designed and constructed on similar lines to one used by the Wright brothers. Moore-Brabazon agreed to fly the machine in an attempt to win the £1,000 prize. The first trials of this machine were unsatisfactory, chiefly because of the difficulty of finding a suitable engine. It was an essential condition of the competition that the aeroplane and the engine must be designed and built in Great Britain. Ultimately a 50-60 horsepower Green engine was fitted to the Short biplane, and Moore-Brabazon flew it at Leysdown, Kent, to win the prize. In 1910 Moore-Brabazon was awarded the first British Empire Michelin Cup for the longest flight in an aeroplane designed and built in Great Britain up to March 31 of that year. To qualify for this, Moore-Brabazon flew a distance of eighteen miles in thirty-one minutes. During the war of 1914-18 Moore-Brabazon served in the Royal Flying Corps (later the Royal Air Force) and became officer in charge of the photographic section of the Royal Flying Corps. With Lieutenant Campbell he was largely responsible for the first specially designed aerial camera. After the war he was a member of the original civil aviation committee, and in 1923 be became Parliamentary Secretary to the Secretary for Air. From 1923 to 1927 he was Chairman of the Air Mails Committee, and in 1934-36 he was President of the Royal Aeronautical Society. You can read more on “The First English Aeronaut”, “The First Powered Aeroplane” and “Flights of Fancy” on this website.